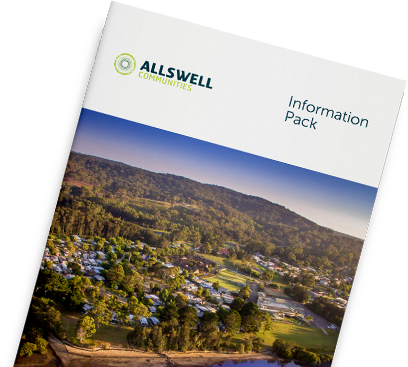 Allswell Communities offer a selection of well priced, architecturally designed, low maintenance homes set within facilities-rich communities of like-minded people. We enable you to own your own home whilst leasing the land to you for a ongoing site rental fee. In many cases your site rental fee may be subsidised by a Government Pensioner Rent Assistance payment*, making your living costs more affordable. Importantly, you still own your own home and can sell it or transfer it to a family member. *If you are eligible for government subsidies please refer to www.humanservices.gov.au/rentassistance. Visit your desired Allswell community and select your site and home design. Fill out an Expression of Interest and receive other relevant documentation. Pay a (refundable) site holding deposit. If you have an existing home to sell, this is the time to put it on the market. Once you have finalised your selection of home design and paid the deposit, we order your home, which takes approximately 12 - 14 weeks to build and have delivered to site. The site is prepared for the delivery of your home including connection to water and power. When your home has been delivered to site and connected to utilities you will be invited to a final inspection. You then pay the balance of the purchase price and are now ready to enjoy your new lifestyle! Below is a guide of associated costs for buying a new home in an Allswell Community. Owners are responsible for the cost of their own electricity, gas, water and home and contents insurance as required. *Aproximate average price of a 2 bedroom new home. **Site fees are indicative only and may vary depending on an individual’s circumstances. # As at October 2018. For more information visit www.humanservices.gov.au/customer/services/centrelink/rent-assistance.